Get A Sneak Peek At The 2014-2015 FAFSA Form! The FAFSA is the single most important instrument that a student/family should utilize to access funds for college. 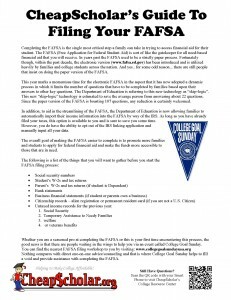 The FAFSA (Free Application for Federal Student Aid) is responsible for gathering information related to the assets and income of families and their students, churning it through a lengthy calculation (you can download a copy of the 36 page formula here), and spitting out an EFC (Estimated Family Contribution). That EFC figure is then sent to all the colleges and universities designated by the student during the FAFSA application process. This is where the magic happens! 😉 Those colleges and universities will take that information and start going to work on putting together a comprehensive financial aid package for you that includes need-based and merit-based awards, a work-study component, and usually a federal direct student loan option. 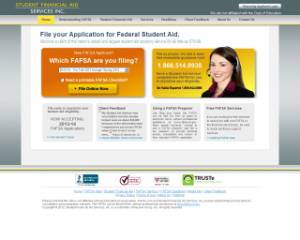 Officially, you can not file your FAFSA until January 1st of 2014. You can submit the paper option (access a draft of 2014-2015 FAFSA here) but I recommend that everyone complete their FAFSA online at www.FAFSA.gov. You may be tempted to go to FAFSA.com, however, even though they will gladly file your FAFSA, they will also charge you about $80 for their services. Remember, the first “F” in FAFSA stands for FREE. 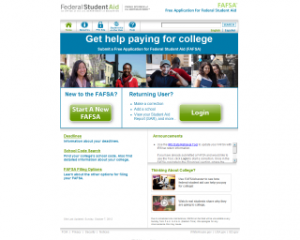 College Goal Sunday – Helping FAFSA Filers Nationwide! Student loan debt is now the second highest ranked consumer loan debt, next to mortgages, according to the New York Federal Reserve, with the amount of outstanding student loan debt exceeding $1 trillion in March of 2012. Given this shocking number, it has become increasingly important to seek alternative or additional means of financing for a college education. Fortunately, financial aid is also available to students in the form of scholarships and grants. 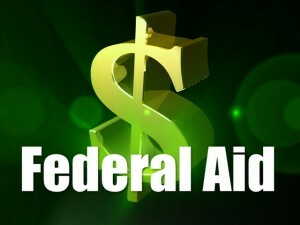 This is where the Free Application for Federal Student Aid (FAFSA) comes in. You need to complete and submit the FAFSA in order to be considered for financial aid such as the Pell Grant and various other scholarship programs. If any questions arise along the way, make sure to turn to a resource that can answer your important FAFSA questions. While the FAFSA can be the key to receiving the financial aid you need, it is a lengthy form that requires a lot of detailed information, which makes it more likely you might fill something out incorrectly along the way. Unfortunately, one mistake could spell the difference between aid and no aid. Don’t allow your child to miss out on a valuable scholarship or grant because of a preventable error. Make sure to follow step-by-step instructions when filling out the FAFSA to avoid making a mistake. Plan your assets. A good type of asset to own when applying for financial aid is a retirement account such as an IRA or 401(k). These qualified retirement accounts, whether owned by you or by your child, are not counted at all in determining federal financial aid. Use caution, however, when withdrawing money from your IRA (or any retirement account) to pay for college. Though the tax law now allows penalty-free withdrawals from a traditional or Roth IRA to pay for qualified college costs, doing so could jeopardize financial aid in the following year. 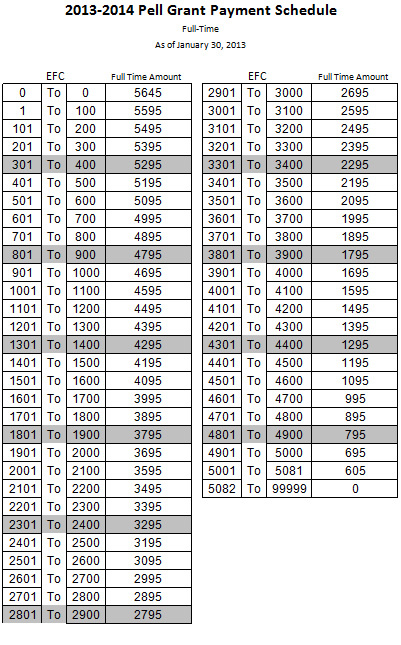 The entire withdrawal, principal and earnings, counts as income on the following year’s aid application. Move savings out of your child’s account. The idea here is that you really have to understand how the FAFSA formula works. The formula counts 2.6%-5.6% of a parent’s assets as being available to pay for college expenses and 20% of a student’s assets as an available financial resource. Basically, this means that assets belonging to the student result in a greater reduction in financial aid. By moving a child’s assets into an account that is not in their name, it will reduce the amount you have to report on the FAFSA. Submit your form early. Filling up the forms can be tedious but you shouldn’t put it off. There are a lot of applicants seeking the same financial assistance as you. Therefore, it’s a good idea to submit your application as early as you can. If possible, submit before the deadline. This is not a good time to dally, because you might just lose out to the students who submitted ahead of you. Write a letter. Since the form itself is quite rigid, some families who experienced special circumstances can add a letter to talk about their situation (like the death of a parent or sudden job loss, for example). Back up the letter with proof and other documents to support it. A lot of colleges will consider what you have to say when deciding on your child’s financial aid package. Check and double check before submitting the form. It’s very easy to make a mistake when you’re filling out a complicated form. Have someone else check your form, too, in case you missed anything. It’s the easiest way to ensure that you got all the important details—and even the minor ones—correct. FAFSA.com vs FAFSA.gov – Which Is The Better Option? College planning is in full swing by high school seniors. After using colleges’ net price calculators to compare their financial aid and costs estimates, students can request aid by preparing the lengthy, and sometimes daunting, federal student aid application (FAFSA). Nearly everyone – regardless of income – qualifies for student aid. To encourage students to prepare a FAFSA each year, the federal government offers two options: either answer FAFSA questions on the U.S. Department of Education’s (DOE) website http://www.fafsa.ed.gov/ for free, or, much like income tax preparation, get help from a service that charges a fee for FAFSA preparation and financial aid advice. By law, FAFSA services must inform students of preparation options. No legitimate service charges for only submitting a FAFSA. Fees pay for application preparation. But avoid paying huge fees. Top FAFSA preparation services cost only about $100 and have refund policies. Most high school counselors don’t have the time or aid expertise to prepare students’ FAFSAs. Colleges’ financial aid professionals often advise admitted students about how to answer FAFSA questions. But extremely few colleges actually prepare students’ FAFSAs. However, most states do offer a one-day College Goal Sunday or other events where financial aid experts answer FAFSA questions without charge. Recommended by Terry Savage, a nationally-known personal finance expert, fee-based service Student Financial Aid Services, Inc. (www.fafsa.com) offers free and discounted help to thousands of low-income students each year. It provides assistance in multiple languages. Time and possibility of mistakes are the top two reasons students choose getting help from a fee-based FAFSA service rather than to tackle it themselves. 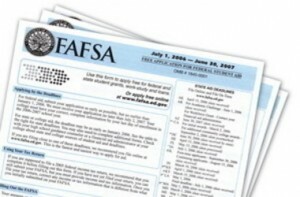 Novices spend about 78 minutes to complete a FAFSA, according to the DOE’s latest statistics. Repeat FAFSA applicants shave only 11 minutes off that time. However, a professional student aid advisor can walk a student (or parent) through FAFSA preparation in about 30 minutes. The FAFSA’s more than 130 asset, income and dependency questions can appear simple. Yet correct answers aren’t always obvious. FAFSA mistakes, such as miscalculating adjusted gross income or counting a primary residence as an asset, will reduce an aid award. When caught by the DOE, mistakes temporarily bump a student out of the virtual, first-come, first-served line for aid. But unfortunately some mistakes that can lower aid don’t get flagged by the DOE for correction. A lot is at stake. During the 2012-13 academic year, $227 billion in federal, state and institutional aid was available to more than 17 million U.S. college students. Last year, undergraduates on average received about $11,000 in aid. Self Help vs. Pro Help. The FAFSA on the DOE’s website includes a ‘help’ feature to guide students. In contrast, a high quality, fee-based FAFSA preparation services offer one-on-one counseling, track and inform students about deadlines, answer difficult or confusing questions, provide estimates of the amount of federal and state aid a student can expect to receive, and most importantly, double check for errors by reviewing every FAFSA answer twice. The best FAFSA services not only use a computer review of a FAFSA, but rely on professional student aid advisors to carefully read each answer. Avoid any service that suggests gaming the system by inaccurately answering FAFSA questions. Also, top services earn an A+ Better Business Bureau rating and are recommended by their clients. For help, the DOE also offers an online chat in English or Spanish –available Monday through Friday mornings and on Saturdays. Some preparers provide experts who speak multiple languages, a service that many parents of first-generation college students find helpful. Fee-based services usually are open for extended hours during the week and on weekends. To be eligible for the most aid possible, apply for aid in January. Students applying in January are more likely to receive more free grant aid than those who delay beyond state or college deadlines. There’s no need to wait until income taxes are filed to prepare a FAFSA. Income can be estimated and a FAFSA submitted early to save a place in the virtual aid line. Income figures can be corrected later. An advantage of FAFSA preparers is that some have access to the FAFSA months before the January 1st start of the aid season. They prepare aid applications with income estimates early and submit them January 1st so their clients are among the first in the virtual line for aid. Whether preparing the FAFSA at no cost on the DOE’s website, or getting help from a professional FAFSA preparation service, be sure to accurately answer questions, sign the application, and submit it in January to be eligible for the most aid possible.